Note: IPSEC VPN is still possible, but getting Windows clients is a little sketchy, and you will have to mess about with them to get them to work on modern versions of Windows. (Mac OSX and iPhone/iPad can connect with their built in VPN software though). 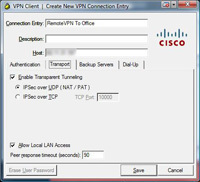 Below is a walkthrough for setting up a client to gateway VPN Tunnel using a Cisco ASA appliance.This is done via the ASDM console. 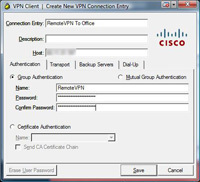 It also uses the Cisco VPN client – This is no longer available form Cisco see the following article. 2. 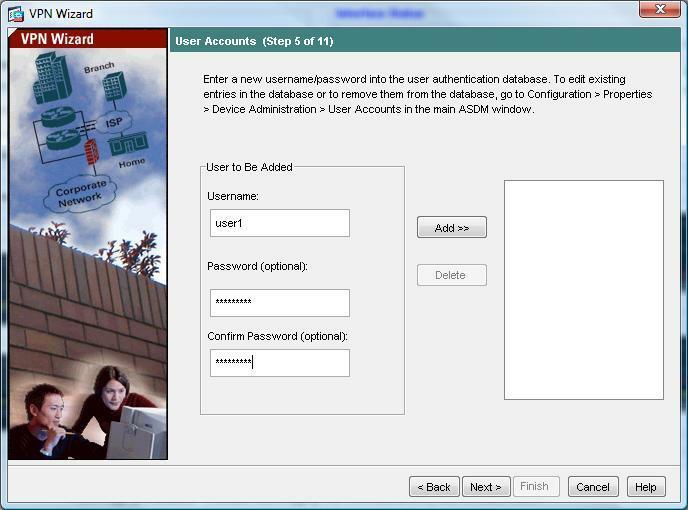 Select “Remote Access”. > Next. 3. 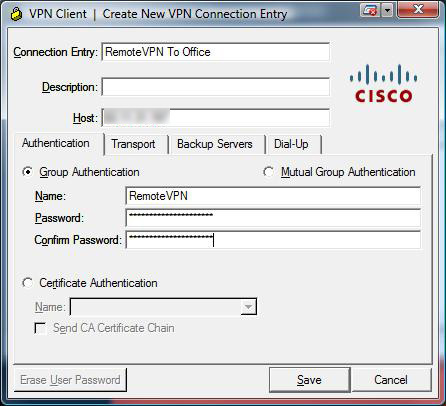 Select Cisco VPN Client. > Next. 4. Enter a Pre Shared Key e.g. 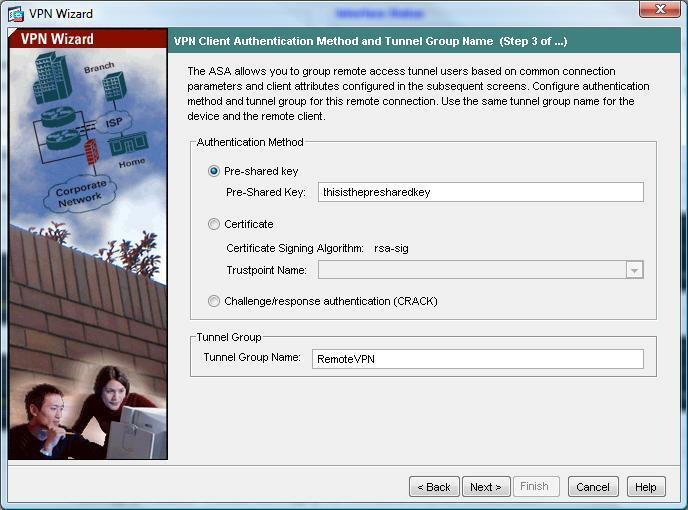 thisisthepresharedkey > And then give the Tunnel group a name e.g. “RemoteVPN”. > Next. 5. Select “Authenticate using the local user database”. > Next. 7. Click Add. > Next. 9. Give the Pool a name e.g. RemotePool and set the start and end IP addresses you want to lease (note these DONT have to be on the same network as your internal IP’s – In fact, for auditing its good practice to make them different). 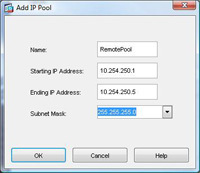 > Enter a Subnet Mask. 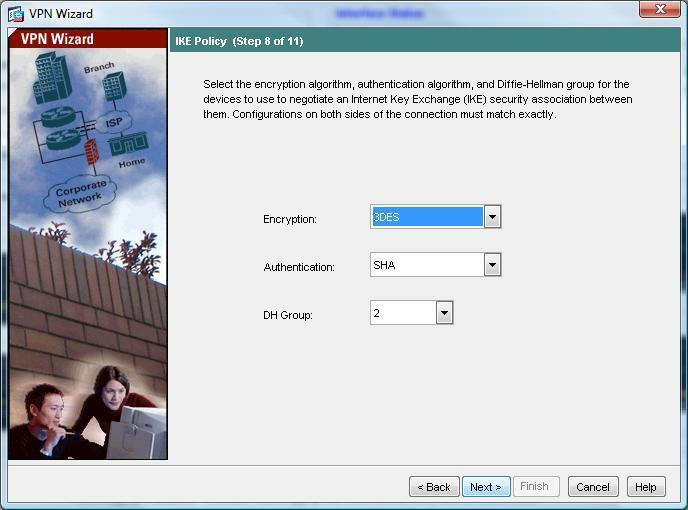 > OK.
11 Enter the details you want the remote clients to use while connected, DNS servers, WINS Servers and domain name. > Next. 13. Again leave it on the default of 3DES and SHA. > Next. 14. 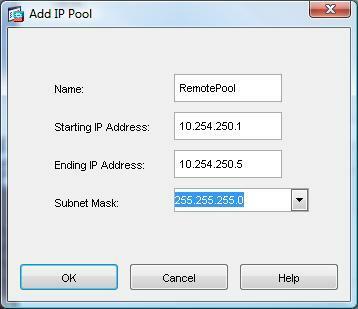 You can choose what IP addresses you want the remote VPN clients to have access to, first change the dropdown to “Inside”, here I want them to have access to the entire network behind the ASA so I will choose 10.254.254.0 with a mask of 255.255.255.0 > Click Add. > Next. 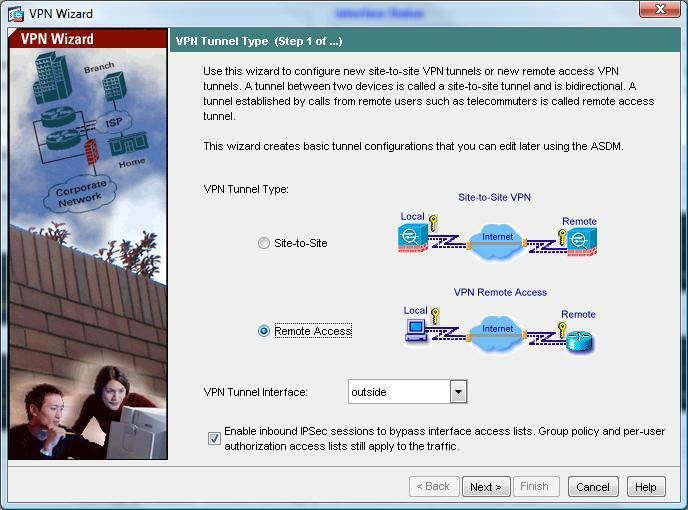 NOTE If you do not tick the box to enable “Split Tunneling” then the client cannot browse the internet etc while connected via VPN. 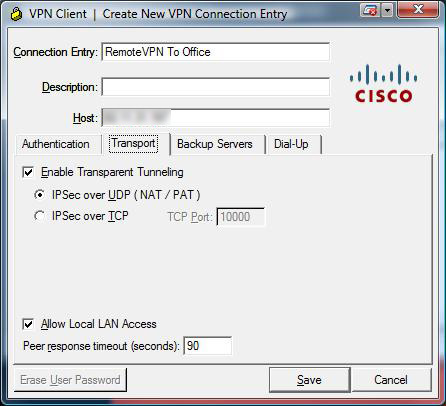 Step 2 Configure the Client VPN Software on the remote client. 1. I’ll assume you have the software installed you can get it from two places, On the CD that came with the ASA, or download it direct from Cisco (NOTE this needs a valid Cisco CCO account and a service contract). > Click New. 2. Under connection entry give the connection a name e.g. “Remote VPN to Office” > Under “Host” enter the Public IP of the ASA (NOTE I’ve blurred this one out to protect my IP address). > Under “Name” enter the name you created earlier (Step 1 number 4) > Under Password use the password you created earlier (Step 1 number 4) and enter it a second time to confirm. NOTE these are NOT the usernames and passwords you created in Step 1 number 6. > Click Transport Tab. 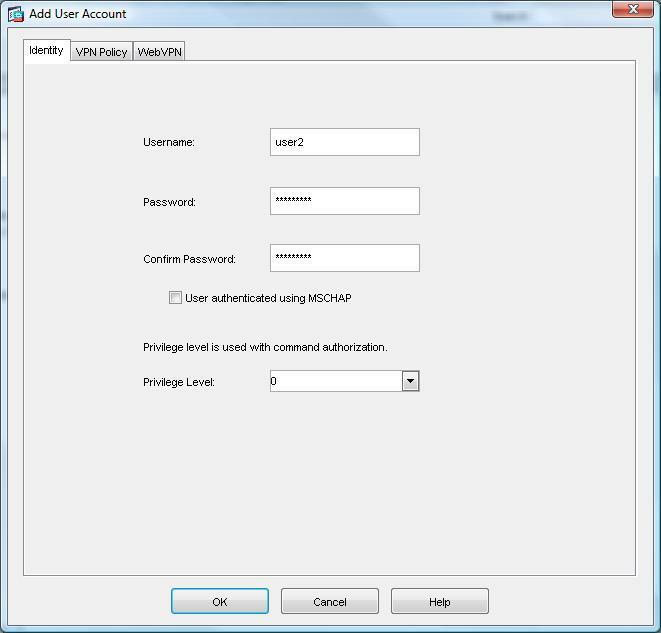 3 Accept the defaults but tick “Allow LAN access if you want to be able to access YOUR drives etc from the network behind the ASA” > Save. 4. Select the Connection you have just created. > Connect. 5. 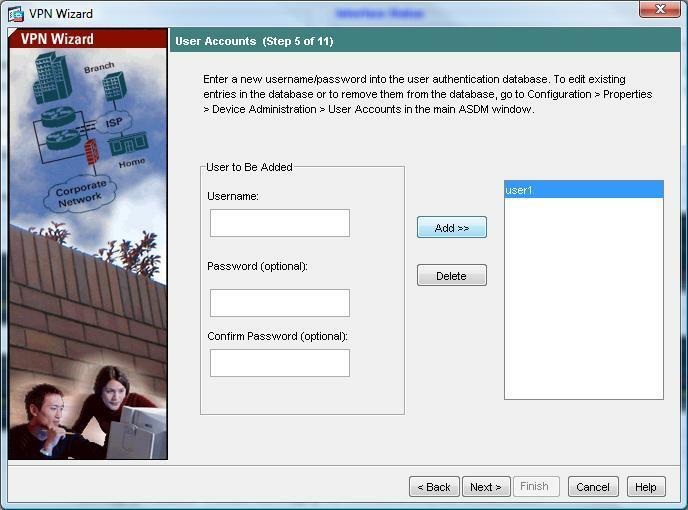 Enter the username and password you created earlier (Step 1 Number 6) of user1 and password1. 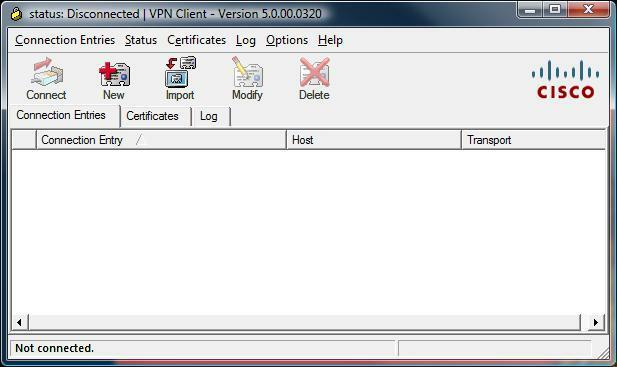 > OK.
6 After a few seconds (provided the details were all right) it will connect, hover over the padlock in your task tray and it should say “VPN Client – Connected”. 1. 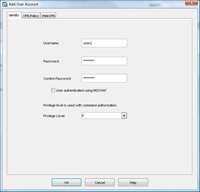 Open the ASDM and navigate to Configuration > VPN > General > Users > Add. 3. 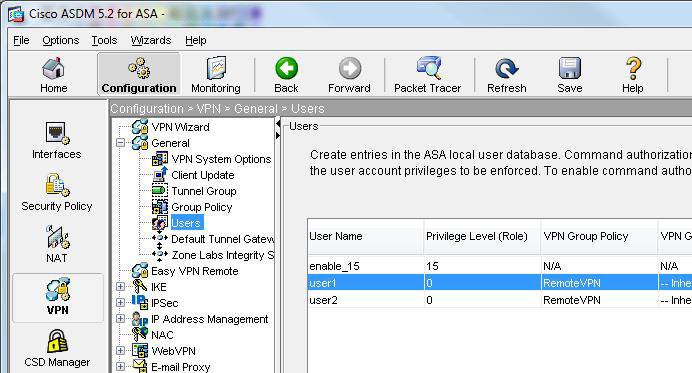 > Under Group Policy untick “Inherit” > Select RemoteVPN (the policy you set in Step1 Number 4) > OK.
4. You will now see the user listed (Don’t forget to save the settings, (File > “Save Running Configuration to Flash”).